Back in the early days of Samsung Gear VR and Google Cardboard, you needed to sideload Cardboard apps to make them work on a Gear VR. Now, with the cunningly titled ‘Play Cardboard apps on Gear VR’ app, you can play whatever you like without having to sideload a thing. Here’s how to play Google Cardboard apps on the Samsung Gear VR. You don’t get the full Cardboard experience due to the physical differences between the two systems. This works best for viewing or passive experiences where no input is required. You will need the Play Cardboard apps on Gear VR app to make this work. It costs $0.99 but is well worth the investment if you want this to work. 1. 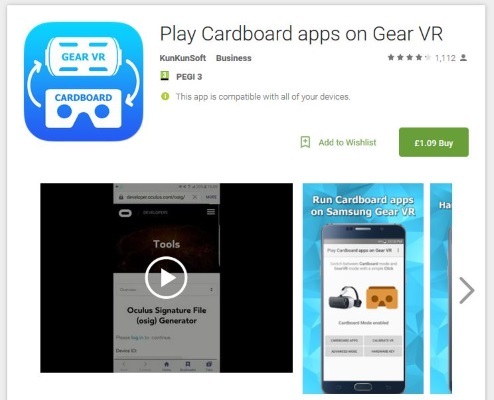 Purchase and download the Play Cardboard apps on Gear VR app. Install it and follow the setup wizard to get everything ready. 2. Select Enable Device Administration within the app, then Activate. This will sort out a license and require the usual T&C confirmation. 3. 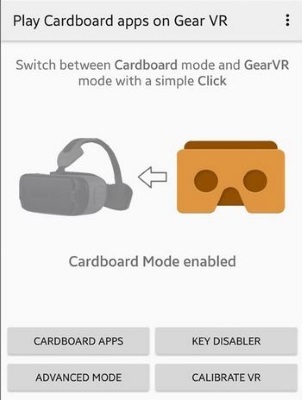 Tap the Cardboard icon on your handset to switch modes to run Google Cardboard. From here you can access Google Play Store and download and install Cardboard games and apps. 4. Visit this website and capture the Cardboard QR code for your phone. Halfway down the page are three QR codes that will tell Cardboard what you’re using. Select the appropriate one for your phone. 5. Once you have downloaded a Google Cardboard app, tap the icon, switch to Carboard mode and tap the game or app icon to load it. 6. Put your phone into the Gear VR to play or use the app. You will then see the Cardboard app or game in VR mode. 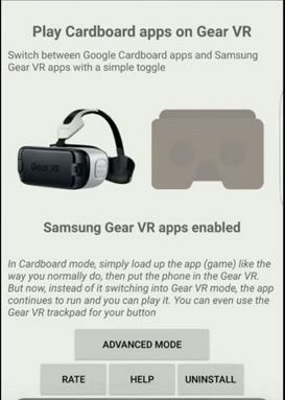 You can freely switch back and forth between Google Cardboard mode and Gear VR mode from within the Play Cardboard app on Gear VR. That’s all there is to it! Play more games on the Gear VR with ‘How to play Steam games with your Samsung Gear VR’ or ‘How to play PS4 games on the Samsung Gear VR ’.